The fair-skinned English knew a thing or two about protecting their skin in the summertime when they carried parasols as religiously as Lindsay Lohan wears leggings. Well, luckily, we’ve heard of SPF, right? In this amazingly techno-beauty age where sunscreens now come in the form of soaps and spritzers, leaving the house without some form of UVA/UVB protection is no longer acceptable. Especially if you’re freckled with skin a la Julianne Moore or even the lassie Lindsay — and even if you have skin as dark and mocha pretty as Halle Berry’s, don’t leave home without that SPF. 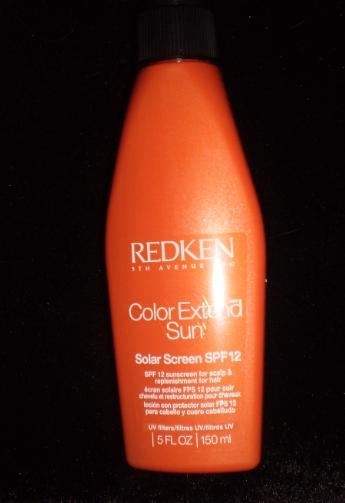 Which brings me to a very timely and laudable launch by REDKEN called “Color Extend Sun Solar Screen SPF 12.” It’s a lightweight, leave-in serum that strengthens and protects sun damaged and flustered hair. It’s particularly recommended for people who have side/middle and fringe parts. This Redken Sun Solar Screen with SPF is a great lightweight oil that you apply to your exposed scalp and hair to prevent burning and peeling. When you apply it, the hair becomes coated with UV filters, and the company’s exclusive Interbond Conditioning System deliver nutrients like Ceramide (that strengthen), and Mango Oil (that hydrates). How do you use this marvelous orange bottle? Spray onto damp hair or dry hair a half hour before you skip out into the sun. $16 at Redken.com or Redken salons. I recommend Shielo’s Color Protect Shampoo & Conditioner. I’ve tried many brands including a lot of other “salon” brands like Paul Mitchell, Nexxus, and this Redken Color Extend… I tend to get easily annoyed when I can’t sleep on my hair at all without waking up feeling like my hair looks like a grease ball. I’m guessing my scalp just produces a little more than average oil. My hair is also thick and wavy and I like to straighten it. Having compared closely with other brands, my hair always feels better with the Shielo Color Protect, shampoo and conditioner, and has a very smooth texture which takes to my flat iron very well. I was apprehensive about the cost, however, alittle goes a long way! I’ve had the bottle for 40 days now, and I still have some left. My other shampoos are done in a month.